A black-lacquered plaster ceiling, incandescent copper lights from .PSLAB and grey polyester kvadrat wall panels frame a seating area furnished with two Cuba lounge chairs by Morten Gøttler and a custom sofa. The site came with a catch, but it wasn’t the location. When the owner of a four-storey concrete building from the ’70s approached Sascha Arnold, Niels Jäger and Steffen Werner about leasing the top two floors, they already understood the appeal of the Glockenbach district. This working-class neighbourhood south of Munich’s centre used to be known as party central, but decommissioned industrial buildings have given way to polished residential and commercial developments with hefty price tags, transforming it into the city’s trendiest area. The three friends were intimately connected with the transition. They got their start in the ’90s, throwing parties in the hot local nightlife scene before founding the Edmoses Bar and the Bob Beaman Music Club. In a room by actor Birgit Minichmayr, French toile wallpaper depicts pastoral scenes, while vintage lighting evokes old- world luxury. 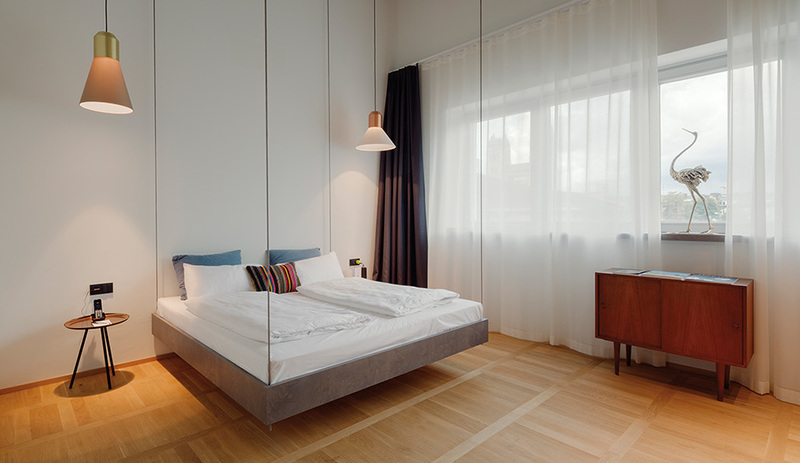 Steel rods mounted from the ceiling allow a custom bed to float in a suite by German musician Michi Beck. Its name, the Flushing Meadows Hotel & Bar (a nod to the U.S. Open Tennis Championships, held in Flushing Meadows, New York), carries on the sports nomenclature of their other venues, named for American, British and French athletes, while referencing the river’s tendency to flood. A copper sign lit by incandescent bulbs points guests to the entrance, an original steel door located off the bustling Fraunhoferstrasse. The ground level has just enough space to accommodate the Super Danke! 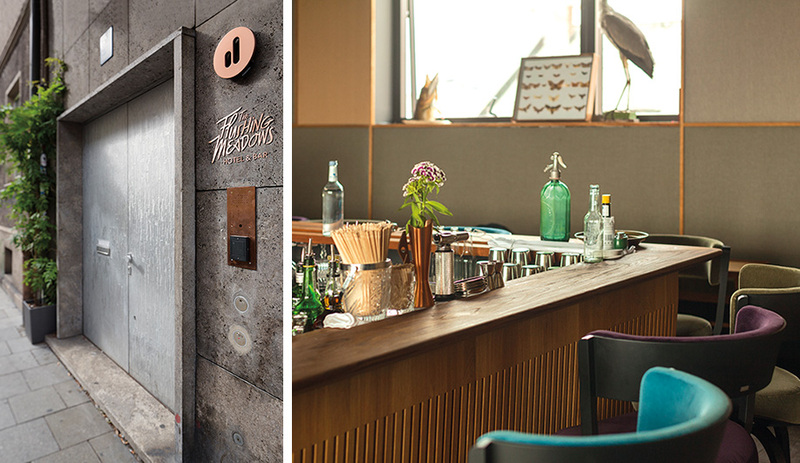 juice bar; and an elevator clad in tombac (a copper-brass material recycled from the bar at Edmoses) that provides exclusive access to the two top floors. Hollywood com­pos­er and music editor Marc Streitenfeld, a childhood friend of Jäger’s, lined a bedroom wall with his images of Munich’s 1972 Olympic Village. the large ink drawing is by Hannes Heinrich. On the third storey, rough concrete walls and ceilings with exposed plumbing that predate the renovation contrast against oak flooring, fabric-panelled walls and copper detailing. Eleven loft studios were created with ceilings that soar over four metres high. On the upper storey is a reception desk in Carrara marble, next to the elevator; and five penthouse studios, three of which feature glass doors that open onto private terraces. 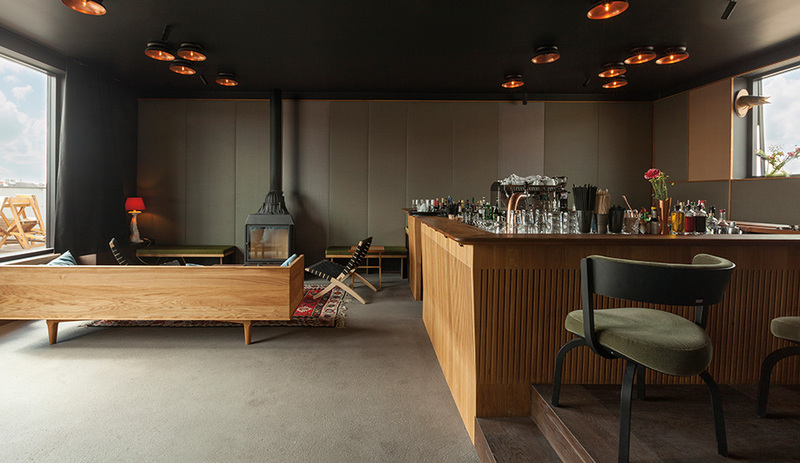 Guests can meet up or fuel business meetings with coffee, small meals and classic cocktails at the invitingly cozy bar and restaurant, also on the top floor, whose roof terrace offers panoramic views to the south; on a good day, the Bavarian Alps can be seen in the distance. Full-height curtains in a muted rose can be drawn to conceal the bed in Fumoir. 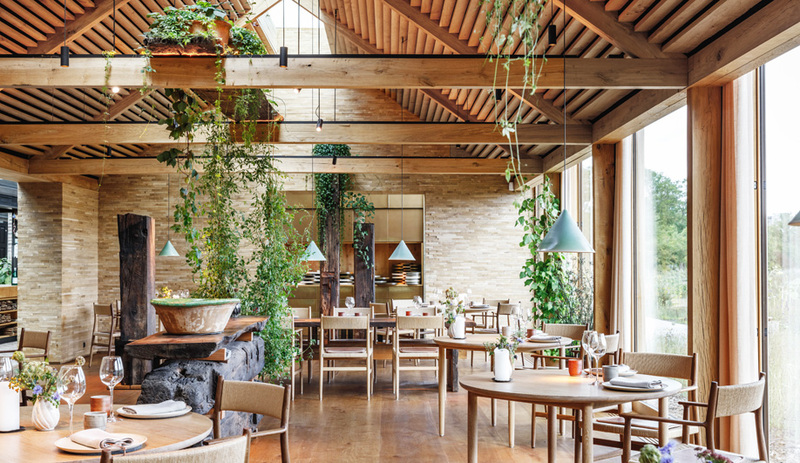 the room’s custom furnishings were designed by Chris­tophe de la Fontaine and partner Aylin Langreuter, of Dante-Goods and Bads. To make each of the loft studios one of a kind, the partners reached out to 12 creative personalities from various fields, such as music, design, cinema and sport: “Some are friends,” says Jäger. “Most travel around the world and know what’s important in a hotel room.” Collaborators included German techno DJ Hell, a.k.a. 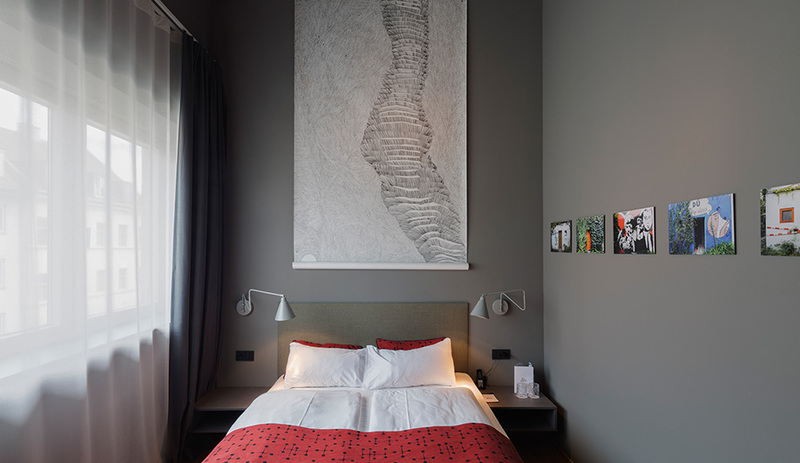 Helmut Geier, whose room features a life-sized skeleton band above the bed, along with his favourite turntable, a Technics SL‑1210, and a selection of records. Another musician came up with an entirely different idea: steel rods mounted from the ceiling allow the bed to float in a suite by Michi Beck, of German hip-hop group Die Fantastischen Vier. “His room is very colourful, with fabrics reminiscent of his travels to Turkey, Morocco and India,” says Arnold. 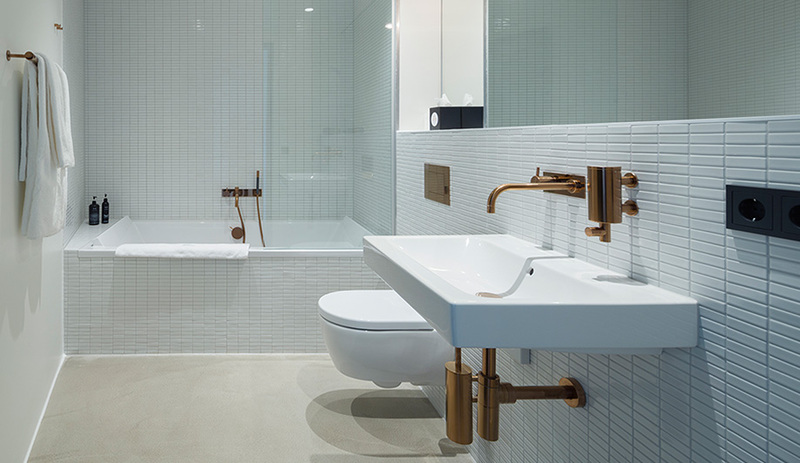 While most of the bathrooms have copper fittings, white tile walls and ivory cement floors, only DJ Hell’s contains a tub – a must for un­winding after gigs. In other rooms, German artist Albert Oehlen covered a sliding bathroom door with a reproduction of an abstract tree painting, while surfer Quirin Rohleder specified a hammock and installed one of his own surfboards on the wall. 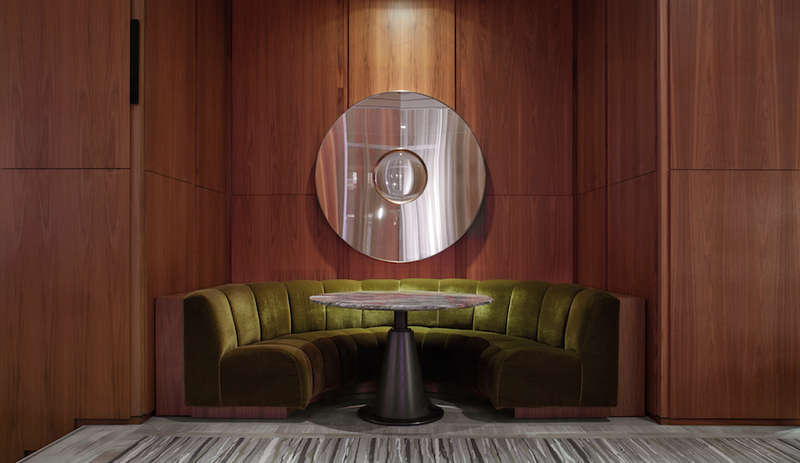 Charles Schumann, perhaps Germany’s most celebrated bartender, wanted an Asian-inspired room. His features Akari Light Sculptures by Isamu Noguchi, a large night scene that depicts coloured light spilling from a Tokyo building, and wooden wall panels the size of tatami mats. “He’s a big fan of simple Japanese design, and of people who do their jobs with personal passion and a love for precision,” says Arnold. While most of the collaborators provided direction or designed a few personal pieces, Christophe de la Fontaine and partner Aylin Langreuter, of Dante-Goods and Bads, chose every detail in their room. 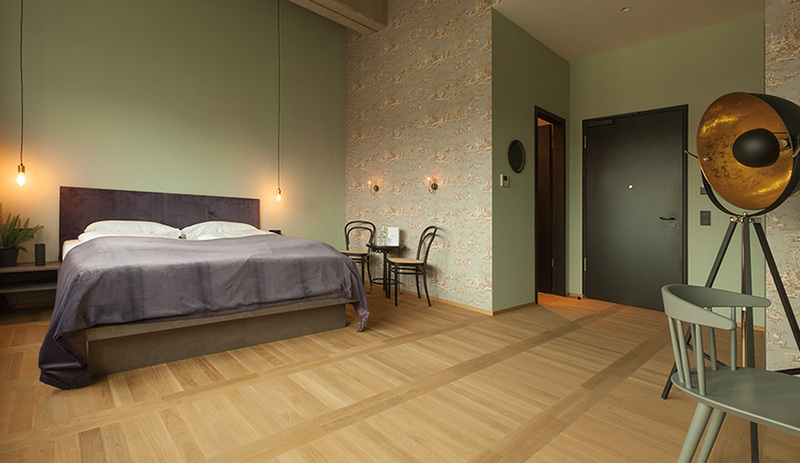 Called Fumoir, the space features muted rose walls, the same shade as the full-height curtains behind the bed, brass and glass lamps, and a chair upholstered in fur. “It’s very warm, and perhaps feminine,” says Arnold. Left: Cathal McAteer, founder of Folk clothing (and Jäger’s brother-in-law), designed all of the furnishings for his room, including a hickory lamp, the shelving unit and an oak chair. 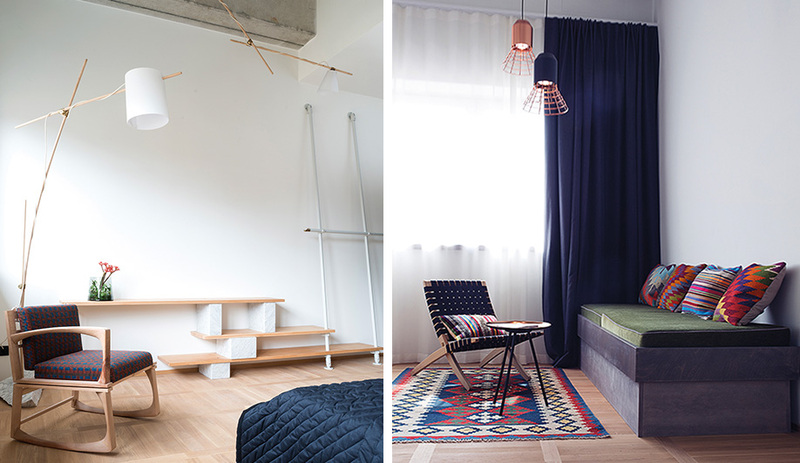 Right: colourful wool kilim pillows on a custom daybed in Beck’s room recall his travels to Turkey, Morocco and India. 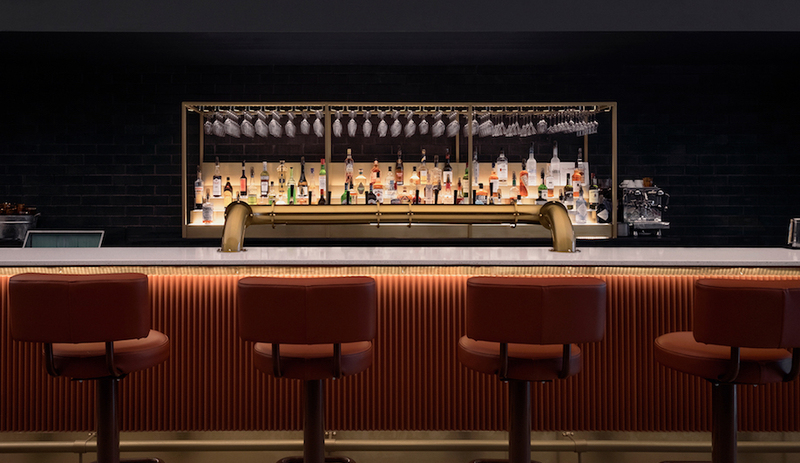 Although it may be a time-limited venture, the Flushing Meadows Hotel & Bar promises to have a lasting impact on the local hospitality scene. 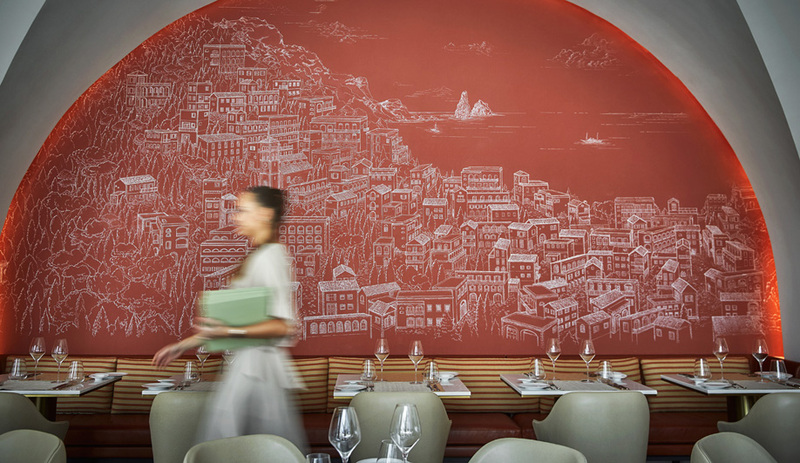 By allowing for diverse perspectives, the creative team crafted a harmonious blend of unique atmospheres that invite visitors to immerse themselves in the multi-layered charm of Munich.